Come see the once thriving historic town of Waterloo Village being restored to it's former glory, as we make the 2017 Metro gathering a spooky Haunted Village Theme! Come walk among the jack-o-lanterns, Ghosts and Goblins, as the spooky deserted old village comes alive for All Hallows Eve! Join Ichabod Crane and travel through the Sleepy Hollow settlement but beware of the Headless Horseman for which each Halloween night he rises as a malevolent ghost, furiously seeking his lost head​! Come in costume and become part of the spooky things roaming the village, enjoy The Legend Scavenger Hunt, carve a jack-o-lantern for a prize or perhaps you'll become part of the Sleepy Hollow folk lore ! 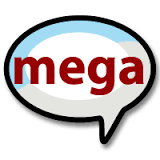 THE EVENT REGISTRATION IS OPEN, DON'T WAIT ORDER YOUR MEGA ITEMS TODAY! ** Metro Gathering Mega Cache page link here! JOIN THE HUNT FOR A GOLDEN TICKET! The 4th annual Metro Gathering Mega Event will be held October 28, 2017, at the Historic Waterloo Village, NJ. 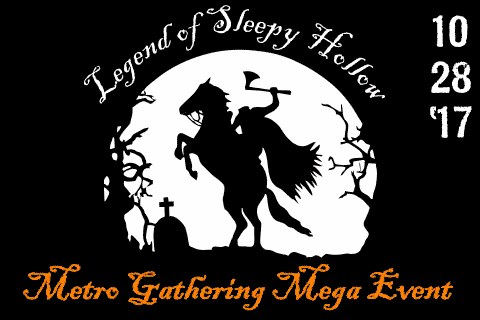 This year's mega event theme we celebrate with "The Legend of Sleepy Hollow." The 2016 "Halloween" Themed Mega event last fall drew a NJ State estimate of between 1500~1700 people! The promotion to advertise the new 2017 fall mega event is already under way! Starting 4/1/17 with the launch of The Village of Sleepy Hollow Colonial dollars "Golden Ticket" contest. We printed 1000 Village of Sleepy Hollow Colonial advertising dollars to be handed out and placed in area Geocaches. In addition, each week a limited number of "Golden Tickets" and some "2nd chance Salmon color raffle Tickets" will be released into geocaches. You never know where they will show up, but they will be placed in many surrounding northeast states, including NJ. NY, PA, CT, DE, MD. The 2017 Metro Gathering Mega - Legend of Sleepy Hollow event will only release 100 Limited "Golden Ticket" Dollars throughout the contest period. These "Golden Ticket Dollars" are numbered, hand signed on each dollar and will be carefully tracked. If one of the very lucky Geocacher seekers finds a "Golden Ticket" Dollar while geocaching, they bring it to the Metro Gathering Mega Event on October 28, 2017, where they will receive one of the​ 100 limited edition Gold Geocoins! The contest will run right up until the Metro Gathering Mega event on October 28, 2017, so seekers will have months of joining in the "Gold Rush" excitement. Geocachers can check the metrogathering.org website weekly, for new clues to possibly aid in the search for new tickets. Some clues may be very easy, while other will take some figuring out. The goal is to have fun, hopefully these lucky treasure seekers will pay off to find a "Golden Ticket". As "Golden Tickets" ticket are found we will be posting finders logs of the geocache location, who found the coveted ticket and their picture with the ticket. "Golden Tickets" will be placed every month throughout the contest period leading up to the Metro Gathering Mega Event on October 28, 2017.